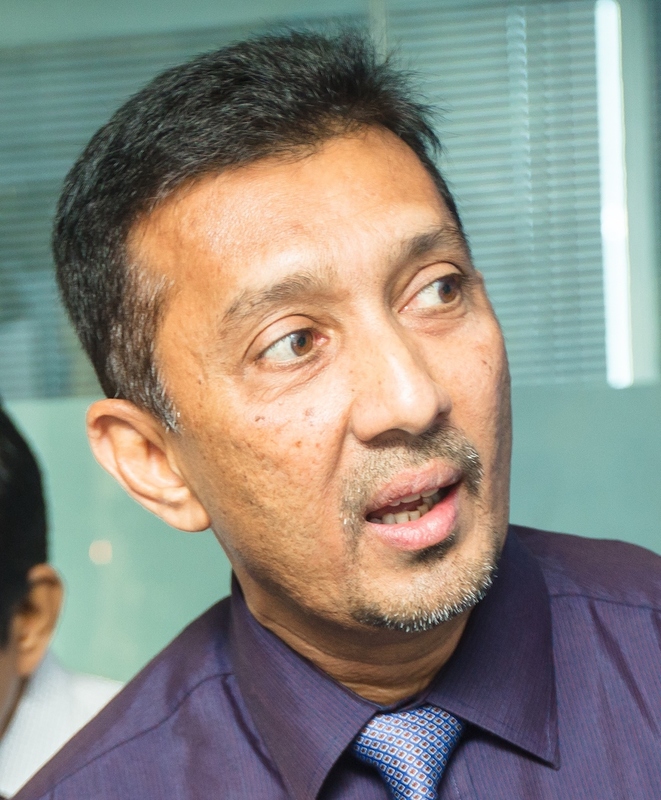 Director Operations Lushan Fernando of the Civil Aviation Authority has been caught on tape soliciting bribes and demanding a stake in Serendib Airways in return for the speedy issuance of an Air Operators Certificate, Colombo Telegraph can reveal today. Serendib Airways & Airport Services is an airline which has commenced their application process to commence domestic air operations within Sri Lanka and subsequently to operate flights from Colombo to overseas destinations. Meanwhile Prasad Fernandopulle the Chairman of Serendib Airways and Airport Services officially submitted the phone recordings and a letter to H.M.C. Nimalasiri the Director General of Civil Aviation Authority on the 27th of November 2018. However more than three works later the Director General CAASL H.M.C. Nimalasiri is yet to commence even an internal inquiry into this complaint. 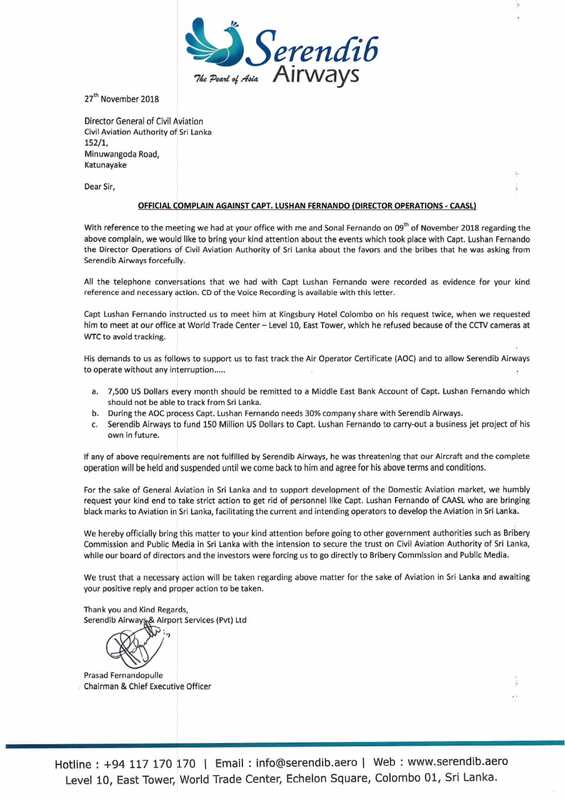 What is further unacceptable is that Director General Nimalasiri is yet to even officially acknowledge receipt of Chairman Serendib Airways’ letter of complaint. When Colombo Telegraph further questioned Director General CAASL Nimalasiri as to what course of action he would take if Lushan Fernando does not resign from his post, he said “What he has done is totally unacceptable. If he does not resign then, I will have to make a decision on that”. What is suspect is in this instance is that Director General CAASL Nimalasiri will continue to brush this aside despite all the evidence being presented. He has done such things in the past too. The CAASL has over the years been embroiled and tainted for many such acts of alleged fraud and corruption. In the recent past, the CAASL also under Director General Nimalasiri was exposed for fraudulently selling the question and answer sheets to pilots who sat their ATPL Examinations. In that instance the ATPL Examinations was under the purview of the former Director Flight Safety CAASL Susantha De Silva who also oversaw Personal Licensing, Flight Operations and Airworthiness who got away despite the matter been investigated by the Criminal Investigation Department of Sri Lanka. Foreign Policy In Sri Lanka: Is It Effective & Productive? බැඳගත් පළාත් සභා බෙරය ගැසීම!